The report, which provides new disclosures about the company’s activities, is very well done. 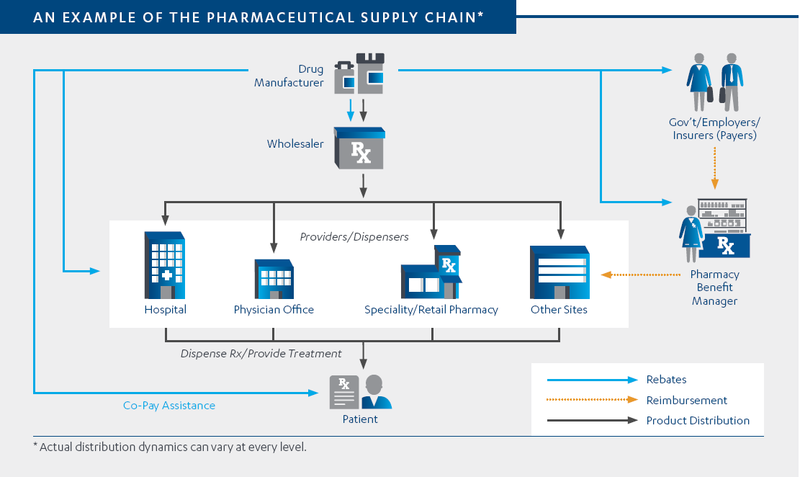 Below, I offer some observations on Janssen’s pricing and its discussion of the drug channel system. 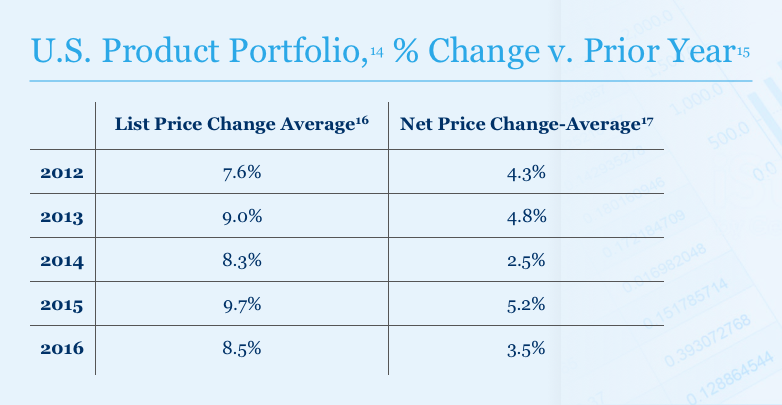 Notably, Janssen revealed that its average list price increases have been below 10% for at least the past five years. Its average net price increases, however, have been roughly half of the list price increases. For 2016, list-to-net reductions were 35.2%. The report makes a meaningful contribution to the ongoing debate about the true pricing of prescription drugs and the gap between a manufacturer’s gross (list) prices and the net prices to third-party payers. Every Drug Channels reader should review it. The Janssen report includes details on many topics, including clinical data transparency, patient financial support programs, and marketing expenditures. I was especially tickled to learn about Janssen’s participation in the wonderfully named Yale Open Data Access (YODA) Project. Impressive, it is. Drug Channels readers will benefit most from the “Value & Pricing” section, which starts on page 6. Click here to access the web version of this section. 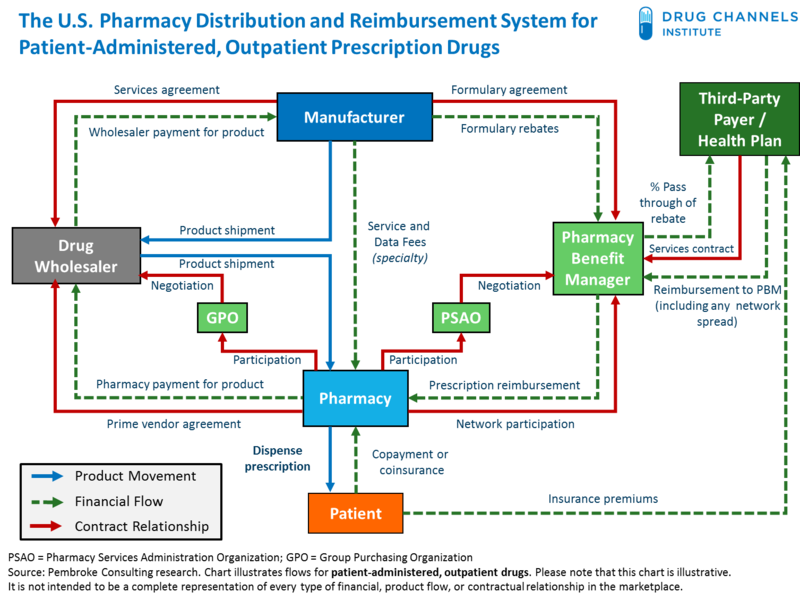 Also notable: The report has a link to the famous Biotechnology Innovation Organization video Understanding Your Drug Costs: Follow the Pill, a.k.a., Follow the Dollar: The Movie! As far as I know, Merck is the only other manufacturer that has released a report on its overall gross-to-net pricing. (See the Merck & Co, Inc., Pricing Action Transparency Report 2016.) The Merck report, however, was a skimpy one-pager that lacked the context and explanation that the Janssen report provides. Recall that Novo Nordisk only revealed its gross and net pricing for two products, as I explain in Novo Nordisk Sheds New Light on PBM Rebates, the Gross-to-Net Bubble, and Warped Channel Incentives. Janssen’s report provides a brief and useful primer on many key terms used in the drug distribution and reimbursement system. The report even distinguishes copayment from coinsurance and rebates from discounts. 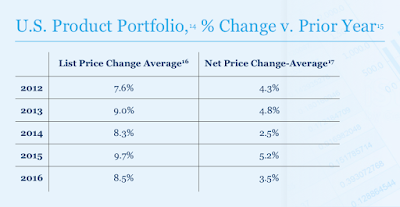 As Janssen correctly notes, its average list price increases fall below the increases of its peers. (Mathematical average of list price increases, 2012-2016 = 8.6%) By comparison, industry-wide average year-over-year list prices for brand-name drugs have been growing by 10% to 14% annually. 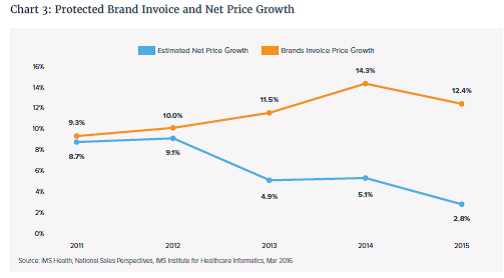 See this chart from Key Insights on Drug Prices and Manufacturer Rebates from the New 2015 IMS Report. Net prices, however, grew by only 2% to 5% annually. (Mathematical average of net price increases, 2012-2016 = 4.1%) Janssen also revealed that in 2016, total discounts and rebates were $11 billion, equivalent to an average 35.2% reduction from the list price. That figure is comparable to the industry average figure that appears in Exhibit 73 of our 2017 Economic Report on U.S. Pharmacies and Pharmacy Benefit Managers. To help tell its story, Jansen embedded videos of various executives explaining the company’s pricing philosophies. Here’s a good one from Blasine Penkowski, chief strategic customer officer for Janssen North America. Click here if you can’t see the video.